OMFG! Look what I found early this morning in my spam box! David Gimlour’s return to Live At Pompeii is playing at Inox Cinemas Nehru Place on Sunday, October 15, 2017. It’s a single show in Delhi and on only tomorrow at 8.15 pm, across 6 cities in India. 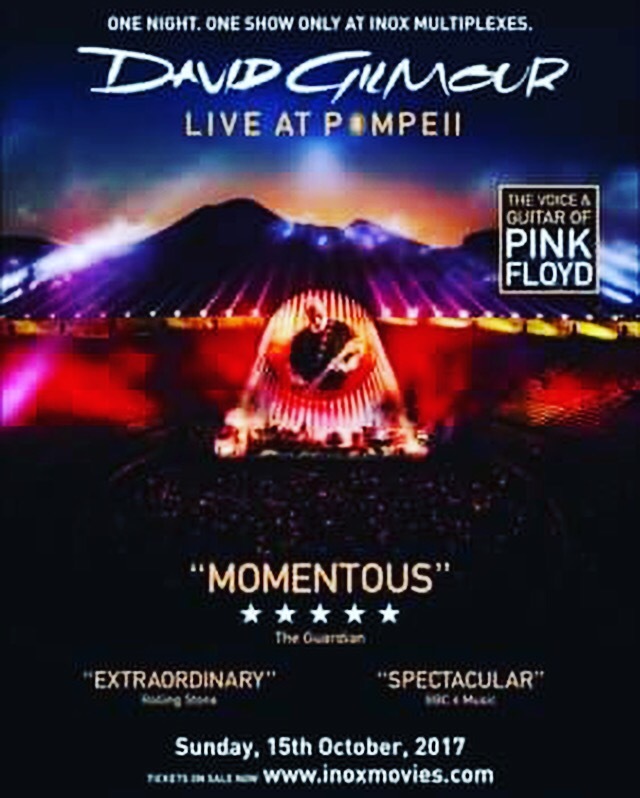 For the uninitiated the rockumentary is a part live album and part film that witnesses the Pink Floyd legend’s return to the cult (both in Floyd & World history) Pompeii ruins (fans would know why) after over four decades. I’m getting goosebumps while just writing this piece here! In one of his interviews to The Rolling Stone dot com, the virtuoso recalls Pompeii as a “place of ghosts”, and how he couldn’t help but think of his late bandmate, keyboardist Rick (Richard) Wright. Don’t worry they’ve got Delhi, Mumbai, Pune, Kolkatta, Goa & Bangalore in the list. Bangalore is the luckiest with 3 shows and Kolkatta has 2, while rest of us get only one show and we’re grateful. The movie was relased internationally on September 29, 2017. The live concert was recorded at the Pompeii Amphitheatre and was the first public performance at venue since the 70s. The film documents his 2015-16 world tour for Rattle That Lock. No spilling the beans on the tracks fetaured yet but of course they’ll be a full blown account after I treat my senses tomorrow evening!